SCVHistory.com | People | Robert E. Callahan Turned Old West Into Tourist Attraction | Story by Dr. Alan Pollack. Robert E. Callahan Turned Old West Into Tourist Attraction. He was enamored with Helen Hunt Jackson's "Ramona" and collected all things Western, including historic relics from Rancho Camulos. Heritage Junction Dispatch, May-June 2017. Original plan for Ramona Village as published in L.A. Times, June 10, 1928. Click images to enlarge. Robert E. Callahan was born Oct. 27, 1892, in Virginia. Eight years earlier, Helen Hunt Jackson had published her novel, "Ramona," which exploded onto the American scene and quickly gained immense popularity virtually unprecedented in American history. 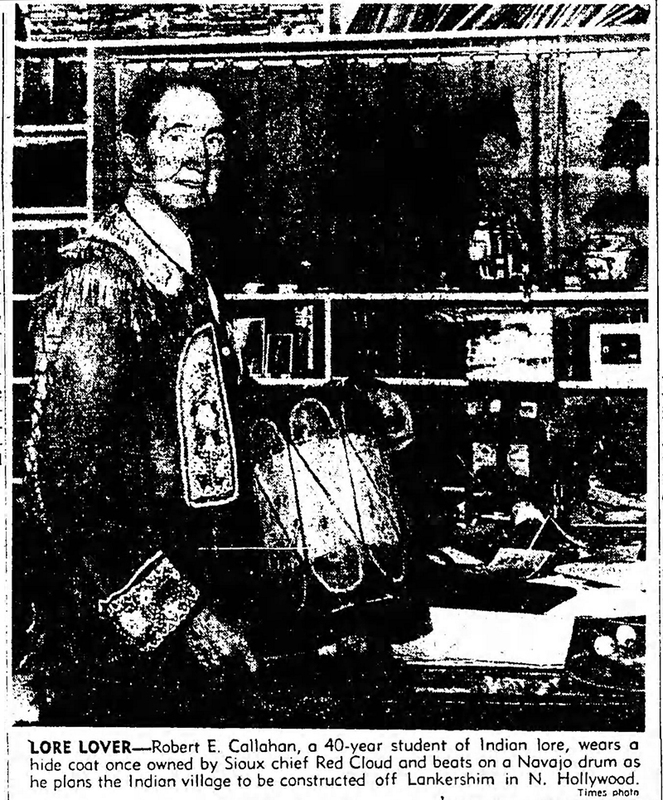 Jackson's intent in writing "Ramona" was to bring to national attention the plight of the Mission Indians in California. In a way, "Ramona" was Jackson's attempt to make up for the failure of an earlier book she wrote, "A Century of Dishonor," a nonfiction treatise that came out in 1881. This book was a history of injustices done to Native Americans over the previous century. Jackson had hoped that her book would help change government policy and abuse toward Native Americans. To that goal, she sent a copy of "A Century of Dishonor," at her own expense, to every member of Congress. The book was criticized as being dry and overly sentimental, and it failed to have the impact Jackson had hoped for. In "Ramona," Jackson sought to use a fictional story of the tragic romance of the full-blooded Indian Alessandro and the half-Indian, half-Spanish Ramona to illustrate the abuse of Native Americans in a more interesting and emotional way. She failed yet again in her quest, as the romance and the picture that she painted of Southern California completely overshadowed her original intent. But "Ramona" was still to become the most popular novel of the late 19th and early 20th centuries, and it brought a boom of tourism to Los Angeles as people sought to see the sites of the Ramona story, one of which was Rancho Camulos in the Santa Clara River Valley (the presumed home of Ramona). Robert Callahan, like countless other Americans, was swept up in the Ramona phenomenon, and it would form the inspiration for an enterprise that became his greatest legacy. Callahan claimed to be one-sixth Iroquois. L.A. Times, Nov. 18, 1951. Callahan himself was partially Native American. His ancestry bestowed upon him one-sixth Iroquois blood. He was known to speak 14 Indian dialects, and he became a voracious collector of Indian and Western artifacts. He also became an expert in shooting rifles and shotguns, and at age 13 he joined Buffalo Bill's Wild West Show, where he was able to show off his shooting abilities until he was kicked out after they discovered he had lied about his age. Callahan then jumped on a train and hoboed his way to New Mexico, where he lived among the Indians for the next two years. His next stop was Los Angeles, where he landed a role in a silent movie. The next year, Callahan went to Chicago to study advertising. There he came up with a retail idea that developed into a coast-to-coast operation which made him wealthy and allowed him to "retire" to California in the 1920s. He subsequently published a book on advertising and sales, and he produced radio shows for Warner Bros. in Hollywood. He wrote Western stories for the Los Angeles Times Sunday Magazine. He also wrote books on Indians such as "Heart of an Indian," "The Lone Indian" (which he claimed was the basis for the Lone Ranger), "Santa Fe Trail" and "Daughter of Ramona." Of his 10 books, three were turned into movies. Callahan authored the original Ramona Pageant, which is still held to this day in Hemet. He constructed the pageant around a sequence in the play, "Ramona." He married his second wife, the former Marion Carney, an actress, in a small Arizona town in February 1950. They moved into a two-story home built by Callahan in Toluca Lake. Callahan was quite an accomplished man by the 1930s, but it was his next endeavor for which he is be remembered. He embarked on a project to recreate life in the Old West on a lot on Washington Boulevard in Culver City. 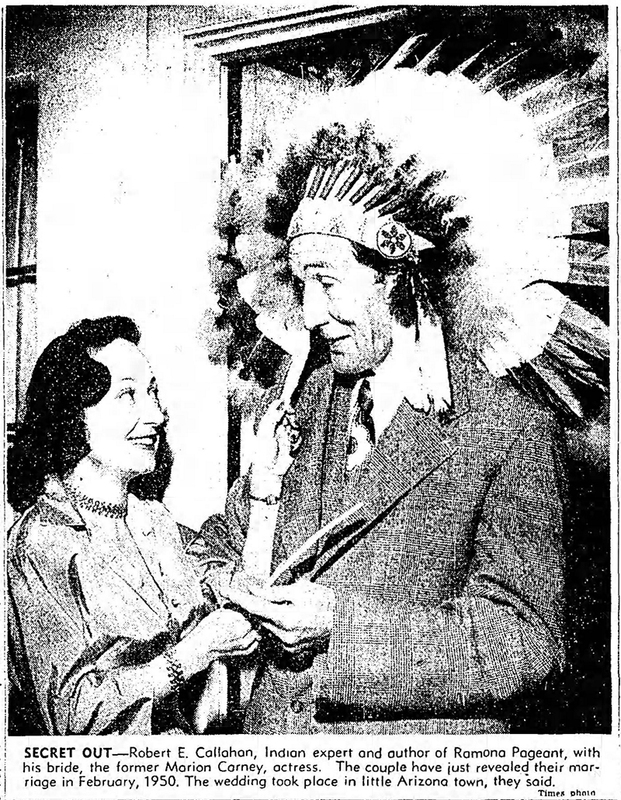 On June 10, 1928, the Los Angeles Times reported: "Dedicated to the American Indian, his tradition and welfare, Ramona Village, comprising a group of structures costing approximately $500,000, will be constructed immediately on a three and one-half acre site at 5675 Washington Boulevard, it was announced yesterday by Robert E. Callahan, Indian authority and president of Ramona Village." 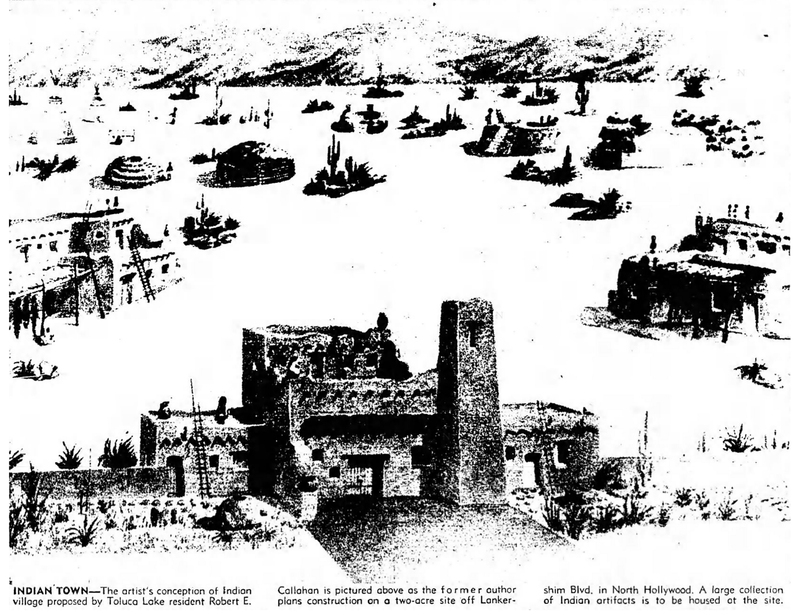 The original plans called for the construction of a 2,000-seat theatre, trading post and museum, Spanish café, amphitheater, stereotypical Indian village, replicas of canyons, Ramona garden, realistic representation of Death Valley and parking spaces, all surrounded by an ornamental wall. Callahan planned to host at the site "alluring Spanish and Indian operas and symphonies, Spanish fiestas and primitive Indian dances and pageants." Programs at the Village were to include "Indian runners, musicians, sculptors and artists from many tribes, various dances such as the Montezuma Ball, and pageantry." The Village would be inhabited by Indians making beads, bracelets and rugs. L.A. Times, Aug. 26, 1928. The next month, the architectural firm of Meyer & Holler was chosen to build the village. The same firm had supervised the construction of Grauman's Egyptian and Chinese Theaters in Hollywood. They planned to build "massive columns, buttresses, huge beams, ceilings, towers, and tile roofs ... true to early California type. Pathways, caves and mountain peaks will tower above the clustering pueblos. Another feature will be the Spanish Café, and from its center diners may peer through massive windows into gardens of flowers and listen to tinkling guitars in the hands of senoritas." 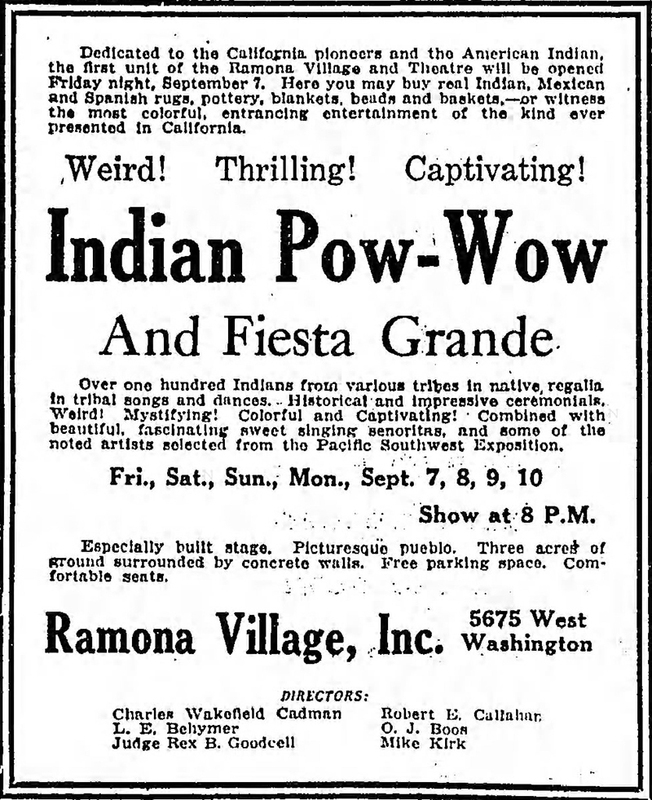 The centerpiece of the Village was to be an Indian Theatre in which an all-native cast would perform a dramatization of "Ramona," as well as other performances by the Indian tenants of the site. Also planned nearby was a kiva in which dances and ceremonies of Southwestern tribes would be demonstrated. Scattered about the facility would be workshops and studios of Indian craftsmen and artists. The first building in the Village was completed July 7, 1928. In November, Meyer & Holler revealed plans to build the Ramona Chapel, to be used as a "literary center and unique marriage place." 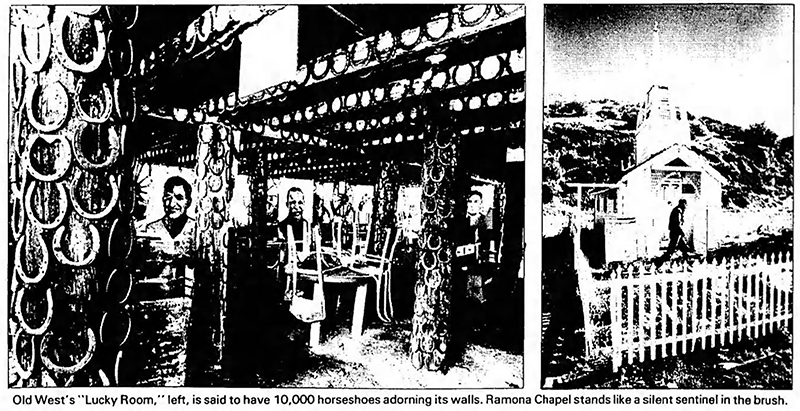 It was to be a replica of the chapel at the Rancho Camulos. In 1947, the Los Angeles Times reported that Callahan had built the chapel in memory of his first wife, Essie. The church was 18 feet long by 6 feet wide, accommodating 16 persons, two to a pew, and the altar featured a white-backed Bible that had been donated by the late singer-songwriter Carrie Jacobs Bond ("I Love You Truly," "A Perfect Day"). L.A. Times, Sept. 23, 1929. 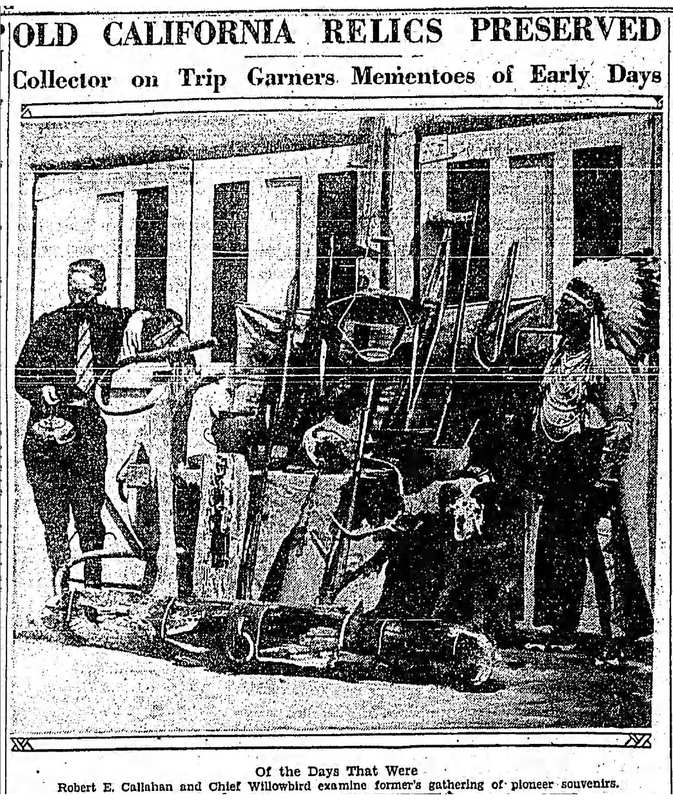 In September 1929, Callahan embarked on a three-week trek across the state to find Old West artifacts. He brought back 63 items to Culver City, stating: "I find that historic evidences of the development of the West are cherished by all true Californians." Among the items he claimed to have found were a ski made for Joaquin Miller, an old yoke reputed to be the last used by the Donner party, two Indian guns presumed to be relics of the Soldier Creek Indian fight, a windlass used in 1849 in the Bodie ghost town, a saloon chair from Carson City in which Mark Twain reportedly sat and wrote his famous Calaveras frog story (and in which three men were killed while sitting in it), a sugar bowl from which John C. Fremont took sugar to sweeten his coffee on the morning he started south to capture Los Angeles in 1847, a three-legged stool said to be made by an Indian who was thought to be the real-life model for Alessandro in "Ramona" (donated by Isabel del Valle Cram, a former owner of Rancho Camulos), a pot and kettle given to Jack London by friends in Bodie that he used on his first trip to Alaska, and a battle-ax swung by the outlaw Black Bart. In May 1930, Callahan announced plans for construction of a building to house the Ramona Supper Club one block over from his village. It was to be a nonprofit organization whose mission was to "preserve the traditions of old California, further an interest in the arts and crafts of the American Indian and encourage the development of present-day composers, musicians and artists of California." The building was to be patterned after early Indian architecture, with "doors, peep holes, recesses and passageways typical of the Indian architecture found in Orifla, Touoss, San Juan, San Domingo, and Santa Fe, N.M., many centuries ago." 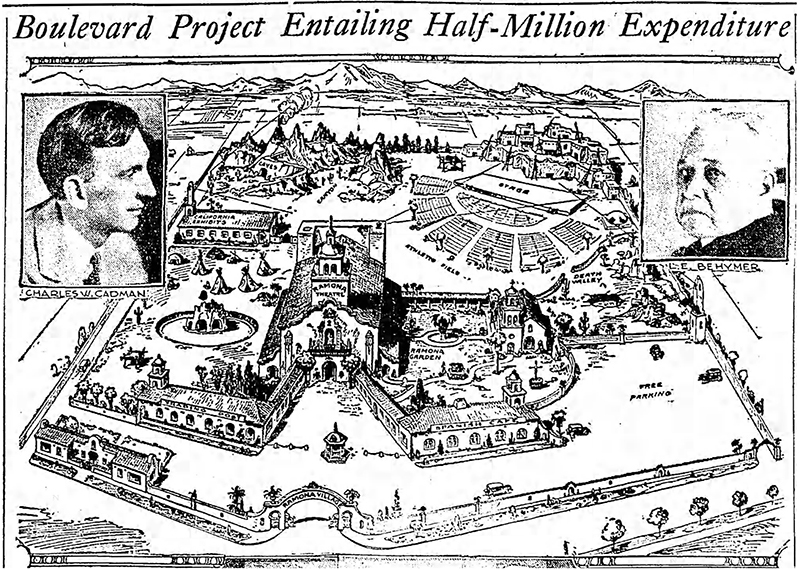 Robert Callahan's grand vision of Ramona Village was not destined to be completed. The infamous stock market crash of October 1929 wiped out Callahan's finances, and he eventually had to cease construction of the village. 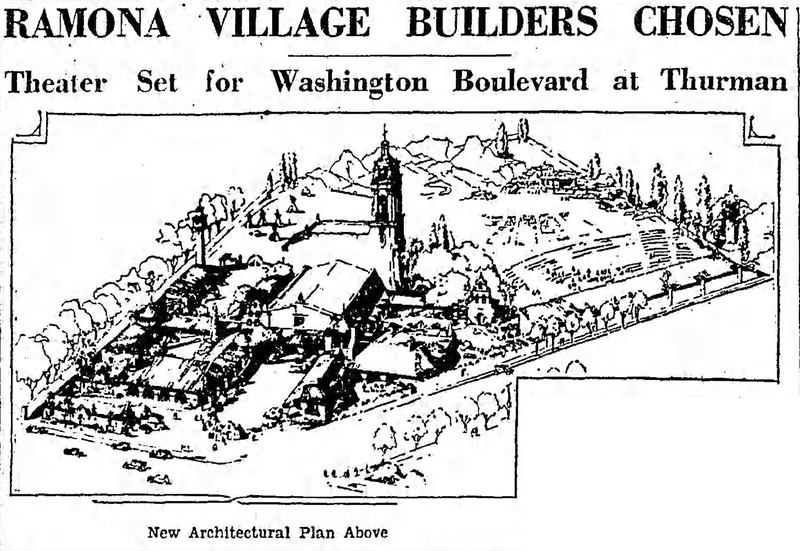 New plans for Mission Village, L.A. Times, July 13, 1930. But Callahan's dream was not to be defeated entirely. 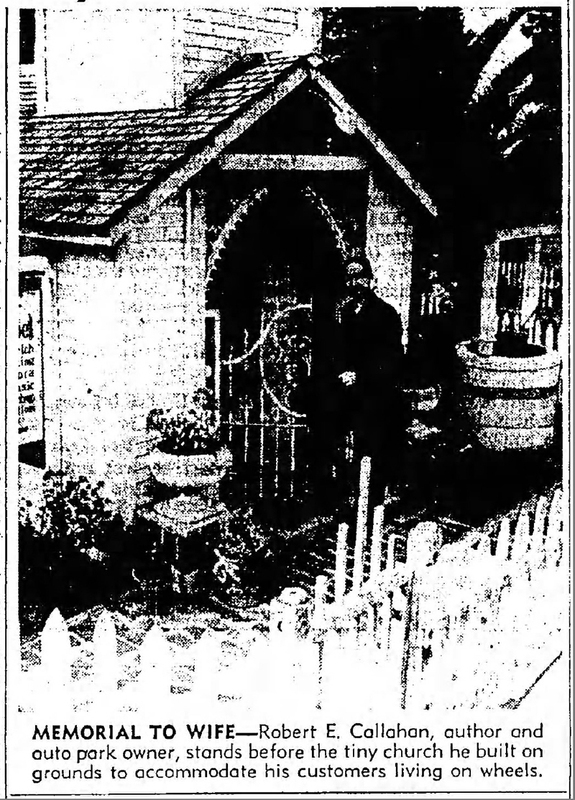 Like a phoenix rising out of the ashes, Callahan managed to obtain new financial backing from two local merchants, and on June 5, 1932, he announced the near-completion of his Mission Village on the same site of the defunct Ramona Village. 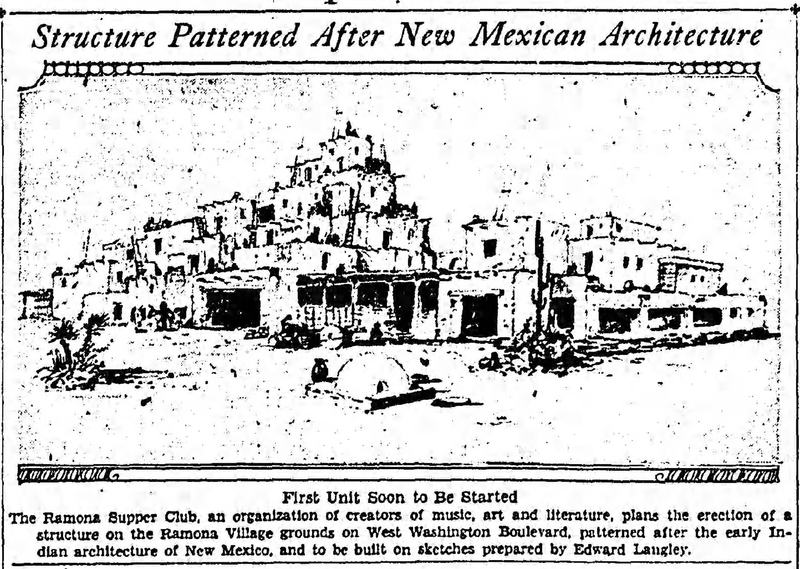 The new complex was to have 15 Spanish-type buildings and 26 Indian pueblos. As described in the L.A. Times: "Completed is a Fiesta Hall, an old trading post, constructed out of weathered beams and cross ties, and a '49 museum with $25,000 inlaid mahogany bar shipped from one of the historic mining towns of Northern California. The museum has been equipped with several hundred relics of Kit Carson, the Custer battlefield, of the days of Ramona, and other pieces around which thrilling stories of the Indian and pioneer are told." Mission Village was also to be an auto park with accommodations for the motoring public. The venue formally opened with an elaborate entertainment program on the evening of July 23, 1932. L.A. Times, Jan. 6, 1947. "The old trading post at Mission Village was constructed by Indians whose ancestors constructed San Juan Capistrano Mission. Crossties, mud and straw were used for the walls. Massive beams 65 years old, once used as runners in the wine cellar of the Camulos Ranch on which the story of Ramona was laid, act as a mantle above the 10-foot fireplace. Over this fireplace is a $3,000 pueblo painting, done on cement by F. Tenney Johnson, celebrated Western artist. The heavy wooden floors of the trading post were taken from the walls of a '49 saloon near Chinese Camp. In the barroom are many relics and antiques, branding irons from the Pio Pico Ranch, a three-legged stool used by Helen Hunt Jackson when writing part of her immortal story "Ramona" ... two rifles used in the Custer massacre, and five huge wine casks taken from the wine cellar of the Del Valle Ranch above Newhall." There was also an Indian kiva built as a replica of an Indian shrine in San Ildefonso, N.M., and 15 "Spanish-type bungalows equipped with all modern conveniences for housekeeping." It was the first major motel and mobile home park to be built in the United States. Callahan's Mission Village was a great success for the next 20 years, but then bad luck struck again. In 1962, the state of California decided to build the Santa Monica 10 Freeway right through the Village. Callahan would have to pack up and move elsewhere. His original plan was to move the village to a 2-acre site at 7525 Lankershim Blvd. in North Hollywood, but this pursuit was abandoned due to zoning difficulties. L.A. Times, Nov. 29, 1963. Finally Callahan settled on and purchased a 14-acre site at 13660 Sierra Hwy. in Mint Canyon where he built a village of Indian tepees and hogans, frontier cabins, spirit poles and a small Western fort. He called his new attraction "Indian-Frontier Village." It is better remembered today as Callahan's Old West. The Mint Canyon project would also house Callahan's extensive collection of Indian and pioneer artifacts. There would be replicas of a Mohawk wigwam, Sioux tipi, Seminole chickee, Cherokee lodge, the Laguna Pueblo, and a Navajo hogan. In addition, Callahan uncovered an old gold mine in the canyon behind the village. 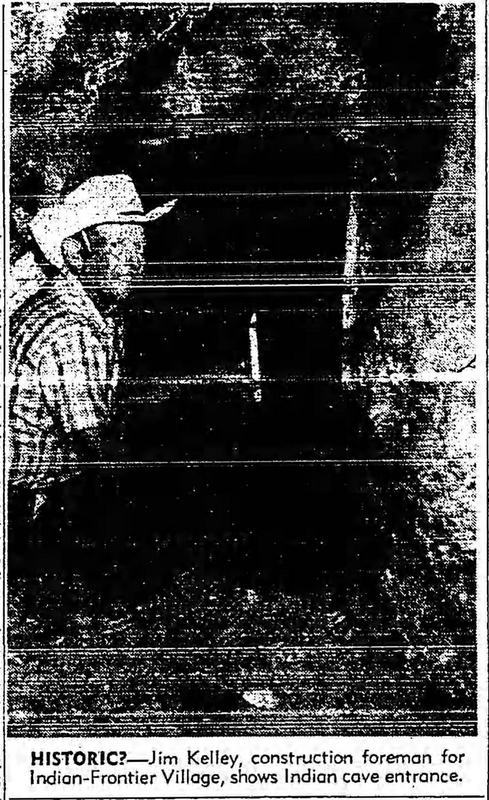 He claimed that outlaw Tiburcio Vasquez was believed to have used the canyon as a hiding place for his horse. He constructed a museum in the style of a Pueblo Indian dwelling to house his collection of 10,000 horseshoes, 412 old wagon wheels, 400 cowbells and a 25-foot painting of the old Santa Fe Trail. There would also be kiva prayer houses, the Ramona Chapel that he moved from Mission Village, a little red school house, a replica of a cabin once occupied by the outlaw Emmett Dalton, a Boot Hill cemetery, and a frontier fort. Indian-Frontier Village opened May 15, 1965. It took two years to finish construction. In addition to the other attractions, there was also a gun collection, miners' cabins, a gold camp rolling store, and the Outlaw Saloon. An official opening ceremony was held May 30. As part of the attraction, Callahan set up a theater filled with authentic leather seats from the old San Francisco Opera house. On weekends, the village featured special attractions such as Indian dancers, Old West gunslingers and vaudeville acts. L.A. Times, Nov. 25, 1962. Callahan proudly stated: "I have used my own funds to buy the acreage and erect the Village, and everything is paid for. I am not out to make a killing. Any profits will be used to build more attractions and buy more Indian and Old West relics. Eventually I hope to be able to turn the entire project over to some governmental agency to be used by the public." The Village was also used for many movie and television shows. Alas, a government-run facility was not in the cards. According to the Times, shortly after opening the Village in 1965, Callahan was hit by a train. He survived the accident but lived in poor health thereafter. In August 1973, Callahan, now in his early 80s, put the Village up for sale. At the time of the sale, the Callahans had retired to their Toluca Lake home, and the Village was open only on Sundays. Due to his ill health, Callahan set the sales price at $125,000 even though he had spent $160,000 to build the site. Callahan died Jan. 10, 1981, at the age of 88. Callahan's Old West survived only as a ghost town after his death. His widow, Marion, maintained ownership of the site, renting the village out as a movie location and as a theater venue for the Canyon Theatre Guild before it moved to Old Town Newhall. Marion ultimately donated several artifacts from Callahan's Old West to the Santa Clarita Valley Historical Society, including with two of the buildings: the Ramona Chapel and the little red schoolhouse. The buildings and artifacts can be seen at Heritage Junction Historic Park in Newhall. The remains of Callahan's Old West still stand on Sierra Highway in Mint Canyon. 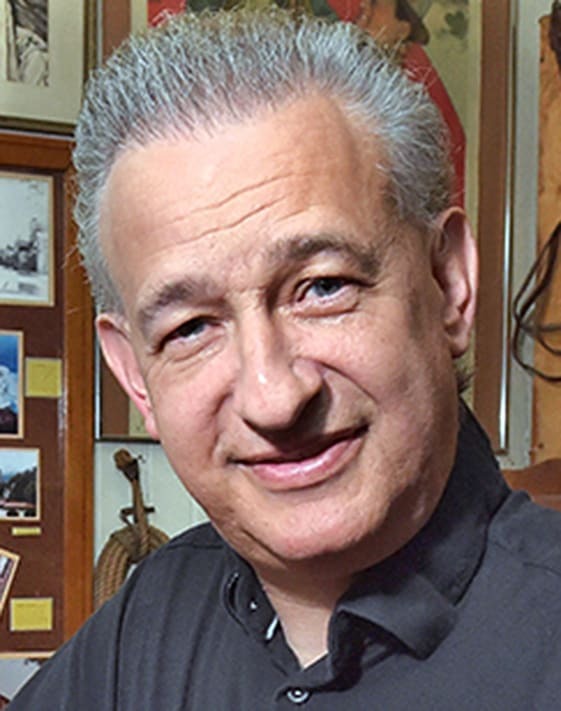 Alan Pollack, M.D., is president of the Santa Clarita Valley Historical Society. All quotes come from articles published in the Los Angeles Times. With the 10 Freeway coming, Callahan in 1962 planned to move his Mission Village to North Hollywood (rendering above), but he couldn't get through the permitting process. So he moved the operation to Sierra Highway in the unincorporated Los Angeles County area of Saugus/Agua Dulce (below). L.A. Times, Nov. 25, 1962 (above) and Jan. 7, 1986 (below).